Salesforce continues to assist CBP, and Benioff has deflected on the issue while his spokespeople have claimed Salesforce isn’t directly involved in family separations. Microsoft trotted out similar excuses when its own employees protested their company’s contract with ICE. As Americans’ awareness of the horrific acts committed in the name of “securing our borders” has risen, so too has the profile of organizations helping those targeted by U.S. immigration policies. Among the most-cited is RAICES, a decades-old group headquartered in San Antonio and serving South Texas. Presumably, this influenced Salesforce’s decision to donate a quarter of the $1 million it pledged to help victims of ghoulish government agencies like its current client, CBP. A spokeswoman did not respond to a request for comment about which other organizations Salesforce had given money to or planned to donate to. In early July, a slew of petitions asking Salesforce to sever ties with CBP gathered more than 100,000 signatures. Early this week, more than 20 businesses and nonprofits, all of whom are Salesforce customers, published an open letter with a similar request, saying that they could not “in good conscious” ignore the company’s work for CBP. “As long as Salesforce keeps its contracts with Customs and Border Protection, they are still enabling the agency to violate human rights,” the letter said. The signatories include Greenpeace International, the New York State Nurses Association, OpenMedia, Manhattan Young Democrats, and the Catholic Charities Diocese of St. Pete, among 15 others. Three organizations confirmed to Gizmodo that, unless Salesforce cut ties with CBP soon, they would end their existing relationships with the company and encourage others to boycott it as well, including: digital-rights group Fight for the Future; Icarus Project, a mental-health support network; and Media Alliance, a media resource and advocacy center founded in 1976. “What has been happening at the border is unacceptable and to engage in business as usual is to be complicit in cruelty and abuse. We ask Salesforce to do the right thing, not the easy thing,” said Tracy Rosenberg, executive director at Media Alliance. The open-internet advocacy group Free Press, another Salesforce customer, said it had pressured the company to end the contract and that hoped it didn’t have to take its business elsewhere. 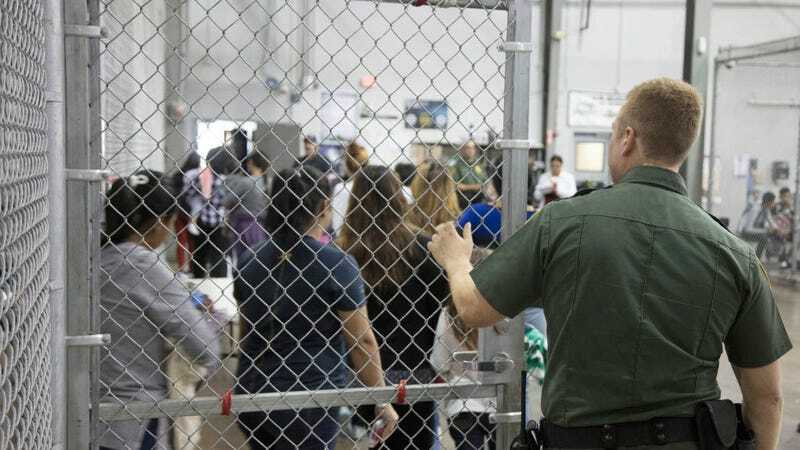 “But that’s something we must consider, if they don’t listen to the concerns of their clients about their involvement with CBP,” said Timothy Karr, Free Press director of strategy and communications. Sue Udry, executive director of Defending Rights & Dissent, a First Amendment nonprofit, likewise confirmed the cloud-service provider was on thin ice with her organization: “We are considering stopping our use of Salesforce,” she said. On behalf of RAICES, we are writing to acknowledge your offer of a $250,000 donation to our organization. After careful consideration by our staff, we have decided to decline this gift unless Salesforce commits to cancel all direct or indirect contracts with Customs and Border Protection (CBP), as principled Salesforce employees have demanded. In response to these employee demands, Salesforce has so far deflected. Instead of cancelling its contract and withdrawing supporting technology from CBP, the company pledged $1 million to “help families affected by the Trump administration policy.” We understand that the $250,000 we are being offered is a portion of this $1 million. When it comes to supporting oppressive, inhumane, and illegal policies, we want to be clear: the only right action is to stop. The software and technical services you provide to CBP form part of the foundation that helps ICE operate efficiently, from recruiting more officers to managing vendors. While you justified continuing your contract with CBP by claiming that Salesforce software “isn’t working with CBP regarding the separation of families at the border”, this is not enough. Your software provides an operational backbone for the agency, and thus does directly support CBP in implementing its inhumane and immoral policies. There is no way around this, and there is no room for hair splitting when children are being brutally torn away from parents, when a mother attempts suicide in an effort to get her children released, and when an 18 month old baby is separated from their mother in detention. Pledging us a small portion of the money you make from CPB contracts will not distract us from your continuing support of this agency. We will not be a beneficiary of your effort to buy your way out of ethical responsibility. We ask you to commit to ending your contract with the U.S. Customs and Border Protection, and we hope that we will be able to accept your donation under these terms. We look forward to hearing from you. Update 12:03pm: Added response from Greenpeace regarding its relationship with Salesforce. Update 12:32pm: Added response from Free Press regarding its relationship with Salesforce. Update 6:18pm: Added response from Defending Rights & Dissent regarding its relationship with Salesforce.